“Flying Between”: A collection of aviation inspired quilt blocks and stained glass pieces. The opening reception for the “Flying Between” exhibit is tomorrow evening, Friday, July 6th, 6-8pm. The Air Museum invites you to join them for some light refreshements and free admission. This exhibit will run through September 29, 2018. 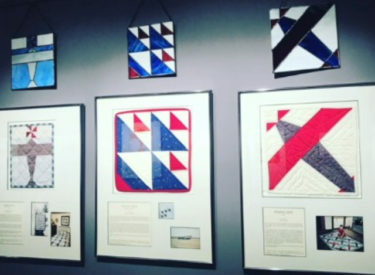 The exhibit features quilt blocks made mostly by women in the Liberal, KS area. These blocks were a project put together in 1993 by quilter Ragi Marino. Some of the blocks in this exhibit are true airplanes, while others are airplanes in name only. The exhibit will also showcase new stained glass pieces made by artist Kim Mangiaracino of Wichita, KS, and a quilt made by Janet Lewis of Turpin, OK. You can get your donation tickets to win a beautiful quilt at the museum, with proceeds will going to the Needles and Friends Quilt Guild and their philanthropic efforts. The drawing will be held during the Liberal Air Fair, September 8, 2018.